Carolina OA » Archive » Tali Taktaki Lodge 70: Big events filled 1938! Tali Taktaki Lodge 70: Big events filled 1938! 1938 was an eventful year for Tali Taktaki Lodge! In April Joseph H. Brinton, National Chief of the Order of the Arrow visited the lodge’s annual meeting at Camp Graystone. There were representatives from East Carolina Council and Winston-Salem in attendance. Executives in both councils were considering forming OA lodges and took this opportunity to learn more about the program. Both councils applied for charters in June 1938. Tali Taktaki’s Degree team installed both Croatan Lodge #117 and Wahissa Lodge #118 that summer. 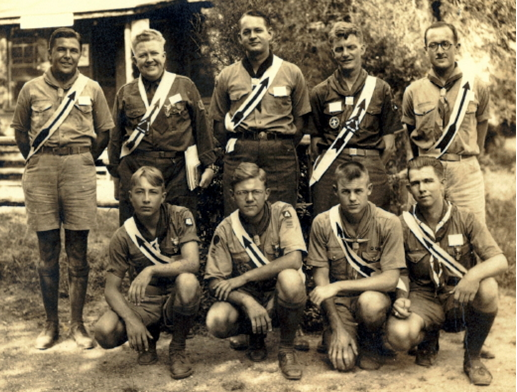 On September 3 – 5, 1938 the lodge sent a delegation of six to the OA’s National Meeting at Irondale Scout Reservation in Irondale, Missouri. Here is a photo of the group along with H. Lloyd Nelson (National Scribe), Frank Braden (Founder of Lodge 70) and Joe Brinton (National Chief 1936 – 1938). At this event Frank Dix and Bob Wolff received the Brotherhood Honor. Notice that they wear the same sash as Ordeal members, but it is worn over the left shoulder. Top row, left to right: Frank Dix, H. Lloyd Nelson, Frank Braden, Joe Brinton, Bob Wolff. Bottom row: Bill Candle, Wade Fox, George Gibbs, Claude O'Brien. On October 5-9, 1938 the University of North Carolina in Chapel Hill hosted the second Carolina Jubilee. This event included 1,425 Scouts and leaders from North and South Carolina. The group camped on the university grounds and attended the UNC – Tulane football game on Saturday. During this event Order of the Arrow members met with a special guest, Joseph A. Brunton, Jr., newly elected National Chief of the OA. While this was not an Order of the Arrow event, it was one of the first “area” gatherings of Arrowmen.